I gave you a grade of D. Vote NO on OBAMACARE, PLEASE! I gave you a grade of F for your recent socialist voting record. Google and watch the movie The Obama Deception. I gave you a grade of F. What is wrong with you people thinking Collins is bad? I understand the cash for clunkers saved us one hour of greenhouse gasses per year. She is looking out for you. OMG! 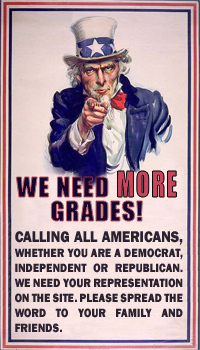 I gave you a grade of F. You are so stupid (Not moderate) You are a socialist/democrat!! You are an insult to the GOP!! I gave you a grade of F.Change your party name to Socialist Democrat and gstay in bed with your sickening counterparts Olympia Snow Bendedict Arlin and Olympia Snow . You are a slimebag! I gave you a grade of F. If the democrates do not have moderates, how can the Republicans?Bow three times and face Mecca along with Benedict Snow and Benedict Specter!! Leave, BEGONE join Specter. You three stooges deserve each other! !